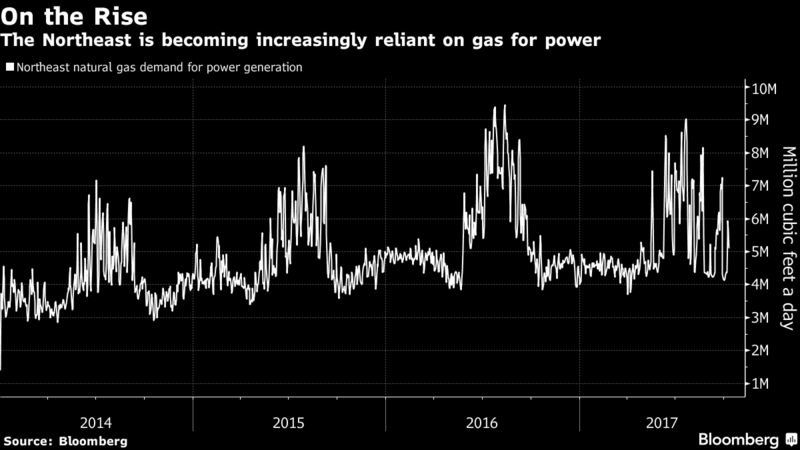 Power companies’ approach to booking space on U.S. natural gas pipelines is becoming the latest flash point in the debate over whether to build more of the links in the historically constrained Northeast. The Environmental Defense fund said in a report Wednesday that New England utility owners Eversource Energy and Avangrid Inc. have repeatedly reserved pipeline capacity for large gas deliveries, only to cancel their orders for the power-plant fuel at the last minute. It’s a move that, the group said, amplified the run-up in electricity prices during cold snaps and cost customers $3.6 billion over three years. The practice is permitted by regulations meant to ensure reliable gas supply, and Eversource and Avangrid say they it didn’t profit from it. The report comes as other environmental groups intensify their efforts to block new oil and gas pipelines, which they say will disturb natural habitats and accelerate climate change. Environmental Defense Fund said in its report that the eleventh-hour capacity cancellations show the gas supply bottlenecks used to justify such projects may be less severe than they appear. Eversource pulled out of a $3 billion New England pipeline proposal last year after a court ruling effectively blocked funding for the conduit. “There were in some instances plenty of available capacity on the pipelines serving the populated areas of the Northeast that bore the brunt of the price increase,” N. Jonathan Peress, senior director of energy market policy at the Environmental Defense Fund, said in a phone interview. Caroline Pretyman, a spokeswoman for Eversource, called the group’s report misleading. Though Avangrid hasn’t fully analyzed the Environmental Defense report, the company reserves pipeline capacity to "protect customers from interruptions" and follows all laws and rules “rigorously,” Michael West, a spokesman for Avangrid, said in an emailed statement Wednesday. “Avangrid has not benefited financially by any movement in the wholesale electricity pricing market in New England,” according to the statement. Avangrid and Eversource, like many utilities, lock in the rights to purchase space on gas pipelines for the long term. In 2008, the U.S. Federal Energy Regulatory Commission issued a ruling that allowed such companies to sell extra capacity not needed for customers to a secondary market, where power plants buy the fuel, according to the report. Because utilities are part of a regulated monopoly, most profits from the secondary market have to be given back to the ratepayers in the form of dividends. It’s not clear why the utilities may have scheduled more capacity than needed, Matthew Zaragoza-Watkins, an assistant professor of economics at Vanderbilt University and one of the report’s authors, said in a conference call Wednesday. “As economists, firms and their decisions are essentially a black box to us,” Zaragoza-Watkins said. But when utilities cancel scheduled pipeline capacity in the last hours of the trading day -- too late for it to be resold -- higher electricity bills can result, according to the Environmental Defense Fund report. It’s a phenomenon that may become more pronounced as the nation becomes more reliant on gas-fired generation, Peress said. “New England is probably the leading example in the country of what the implications of increased gas use and increased reliance on gas fired generators” are for consumers, he said.